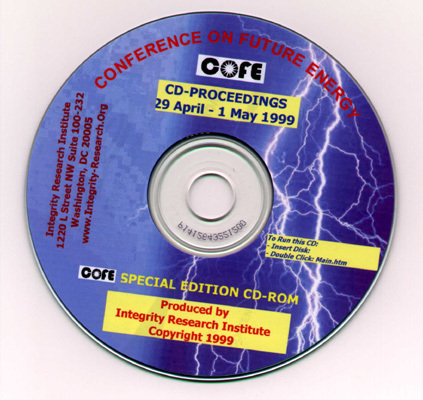 The First International Conference on Future Energy (COFE), April 29-May 1, 1999, hosted by Integrity Research Institute (IRI), was a milestone for emerging energy technology. It was slightly ahead of its time, as now revealed a few years later, after a 135-page (2002) Report #1862 released from the NRL has fully vindicated the 100% reproducibility of cold fusion, summarizing 13 years of funded research. Many of the COFE speakers were new to the future energy audience and people came from all over the world (Germany, Australia, Japan, Russia, etc.) to hear them. Attendance was about 150 total and organizer Tom Valone received a standing ovation at the banquet, after praises were offered from banquet speaker Mark Goldes. Furthermore, there was a lot of tension in the air since the State, Energy and Commerce Departments, in turn, all canceled their hosting of the conference at the last minute, after arrangements were negotiated at each of the government facilities. 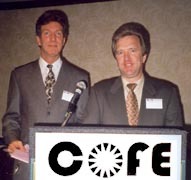 COFE dared to include a couple of lectures on cold fusion, to do justice to the 10-year energy research effort (1989-1999), which apparently became the focus of attention for a media predisposed to criticism instead of praise. For example, Nature magazine (March 11, 1999, p. 98) (www.nature.com) was the first to announce that the "US State Department gets Cold Feet About Cold Fusion" regarding COFE, after Dr. Park related free energy to "new agers" in his "What's New" column of March 5, 1999 (www.aps.org/WN) and unjustly related most COFE topics to cold fusion (when only one plenary speaker, Dr. Storms, talked about it). Science magazine (www.sciencemag.org) carried an article, upon the suggestion by Dr. Park* to Science reporter, David Voss (APS member), centering on Valone (May 21, 1999, p. 1252), entitled, "Free Energy Enthusiast Seeks Like-Minded Colleagues." The Reno Gazette-Journal (June 21, 1999) headlined, "Feds Drop Support for Energy Forum with Pickle-Powered Engines" as the title for its COFE article, focusing on Paul Pantone's invention. Since then, the full story about COFE has been immortalized in the Simon & Schuster book, The Search for Free Energy, by Keith Tutt (p. 260-263) as one of many examples of the active suppression of emerging energy technology. COFE's first day started with Ken Shoulders who detailed his amazing charge cluster technology, proving with electron microscope slides that thousands of electrons repeatedly form powerful bundles. (For a complete COFE summary article, see Infinite Energy magazine, Vol. 5, Issue 26, p. 10. www.infinite-energy.com) Dr. Paul Brown (www.nuclearsolutions.com) described his 25-year lifespan, betavoltaic battery invention and announced his photoremediation of nuclear waste technology in his workshop. Kent Robertson, from the American Wind Energy Association, gave an overview of the wind industry. David Wallman (David.Wallman@mgram.com) had a demonstration of his carbon-arc gasification of biomass solutions which calculations show is overunity**. Paul Pantone started up a few motors right in the hotel room with a retrofit "GEET" device (www.geet.com) that vaporizes and magnetizes the fuel, drastically reducing any emissions and retaining a very high percentage of oxygen in the exhaust. Dr. Peter Graneau then showed how his cold fog discovery is overunity by releasing chemical bond energy. Lastly, Thomas Valone explained the latest zero point energy findings promising a quantum free lunch. The next day, engineer David Hamilton centered on the advances in the DOE automotive research while Dave Goodwin talked about the NASA breakthrough physics propulsion conferences (www.eia.doe.gov). Bruce Perrault talked about several nuclear energy topics including his Perrault (www.cyberportal.net/nuenergy) valve that uses polonium. Dr. Steven Greer (www.cseti.org) talked about the suppression of advanced energy technology, buried in black projects, showing documents that were declassified in the past five years. Les Adam discussed a unique peroxide-powered, noncombustive helicopter and electric car design contest sponsored by his company AZ Industries (www.futuremag.net). Dr. Ed Storms talked about chemically assisted nuclear transmutation in its many forms (including biological), with references. Lastly, Dr. Thomas Van Flandern (tvf@mindspring.com) gave a presentation on the physics of gravity, with a possible energy conversion modality. Later, the banquet speaker, Mark Goldes amazed us with Room Temperature Superconductors, Inc. (mrb@ap.net) Videotapes or audiotapes are available for all plenary speakers except Goldes, as per his request. Park and Zimmerman have certainly affected patent-office affairs before. Patent Examiner Tom Valone was invited by the State Department to organize an April 1999 Conference on Free Energy to explore alternatives to fossil fuels, many of which were controversial. Zimmerman told an APS gathering that Park asked him to put a stop to it. "The week before I was to start [at the State Department] Bob [Park] sends me an e-mail, in which he tells me in some detail about the Conference on Free Energy under the sponsorship of the Secretary of State's Open Forum. It says, 'Pete, if you can't get that killed, what's the point of having you at the State Department?' " The conference was evicted from the State Department auditorium and then from the Department of Commerce. Park says he then called "an investigative reporter" who writes for Science, suggesting he look into the patent office. The reporter, APS physicist David Voss, wrote a scathing article in the magazine's May 21 1999 issue describing Valone's personal interest in novel theories, while acknowledging he never approved patents with questionable backing. Nonetheless, Valone says the report contributed to his dismissal. **overunity is defined as the condition when the coefficient of performance exceeds one (unity). The Proceedings of COFE are available in book form or on CD. as well as 20 hours of RealAudio lectures at no extra cost. It is also available at half price for only $25 during this year.